Since my childhood, there has never been any waste at home. Luckily we weren't served Brussel sprouts every day: I was obliged to stay at the table and to finish all that was on my plate! This discipline is still with me and comes through in my work: having trouble throwing anything away but being at the same time meticulous, I give my work a certain precision by including material which is not habitually used. 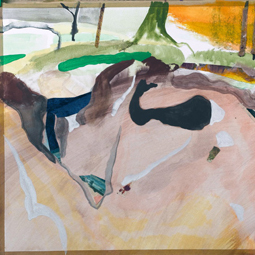 After etching and painting, in 2008 Peter BOND begins to explore the media of AQUARELLE. The result is a stunningly beautiful, coherent suite of 36 works titled "LOST". The series consists of 6 sets, each preceeded by a Painting (The Guide), followed by 5 Watercolors, variations of the theme introduced by the painting. The artist creates his Aquarelles just like his paintings: on the wall. To do so, he fixes the paper with tape. At the end, the aquarelle is cut off the wall, leaving a stretch of tape around the image. These stretches of tape become an integral part of the work. The artist titels his watercolors on tape at the lower right. 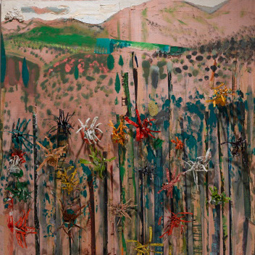 The cut off parts of the tapes often find their way back into the oeuvre, a process similar to that used in his paintings. The following body of work was created between 1978 and 1987 at Stanley William Hayter's Atelier 17 in Paris. 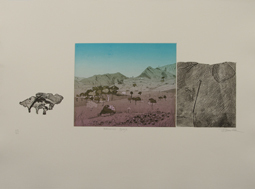 Etchings (gravures) printed on 250gr Arches paper. Unframed. Photos of an installation done in may 2009 in Strasbourg. Peter Bond is a landscape painter. His generous husky painting is on the edge of abstraction and reality. In his painting, we feel something nostalgic and worrying… we hear at the same time a river running, children catching insects, the wind rushing throw the grass… but also the chill of fir trees, the scars scratched on bodies, the foxes burrow… ; here apples baking in the sun throne upon dark landscapes; fields merrily become dripped surfaces burying away any matter produced by the painting activity of the studio. 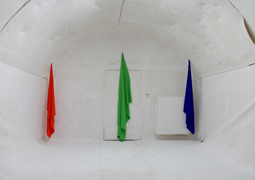 For this project, Peter is naturally at ease mastering painting, installation and performance. 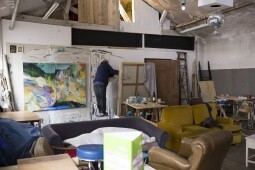 From the start of 2009, his studio was completly covered in canvas and the door, the floor, the walls, the ceiling, the radiators nothing was excluded… He painted everywhere, painting without knowing in what direction that painting atelier could go, he was shooting to make holes… then the whole thing collapsed. The project had been regularly photographed and this is the only witness that exists.